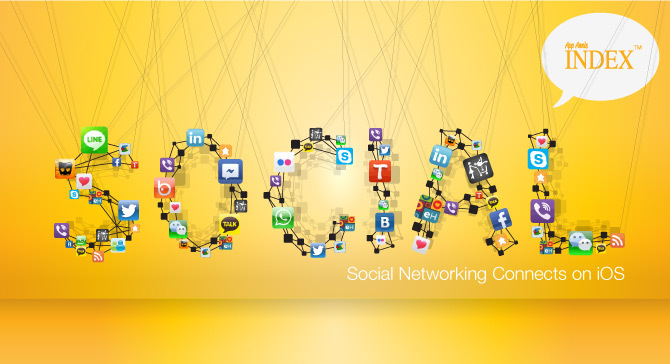 Last year saw the rise of social networking apps. While not as dominant as games, apps such as Facebook, Twitter and Skype helped revenue for the category skyrocket nearly 90 percent, compared to the previous year. 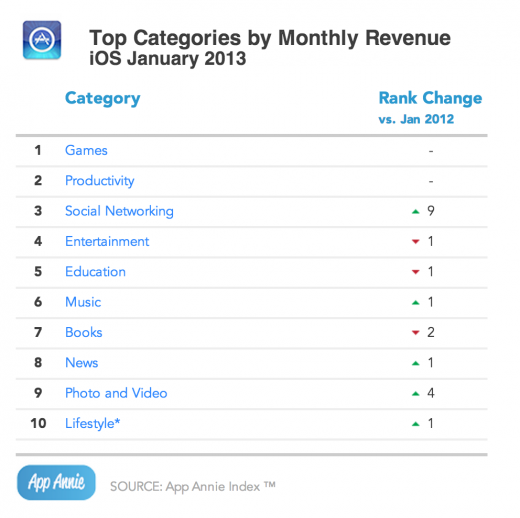 Likewise, social networking apps flew to third place on Apple’s App Store, behind only games and productivity. That’s a notable jump from 2011, when social apps ranked only twelveth. “This kind of growth is perhaps not as stellar as that of other categories, but speaks to a category that has reached a certain level of maturity,” App Annie said in a new study. 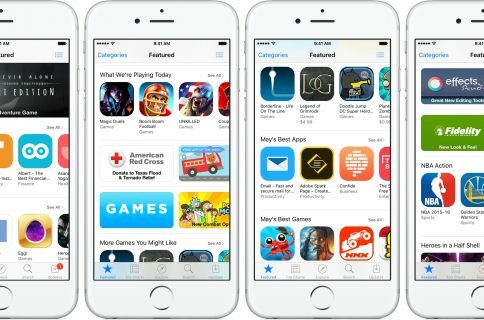 In February, a study found games purchased through app stores from both Apple and Google outsold mobile gaming platforms. The study, which tracked apps downloaded between January 2011 and January 2012, also found downloads of social networking apps from the Apple App Store rose 30 percent, accounting for five percent of all downloads. 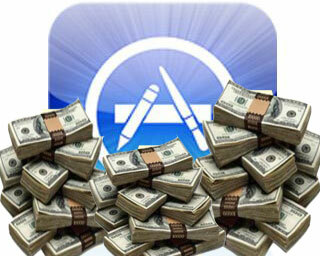 Apple has said its App Store registered 20 billion downloads during 2012. 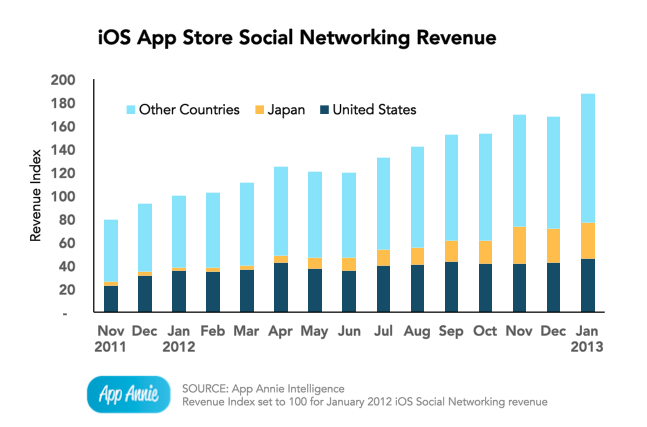 In terms of geographic importance, Japan is particularly driving social networking apps, reportedly greatly due to the popularity of the messaging app Line. Worldwide, Line topped WhatsApp as the leading revenue generator. 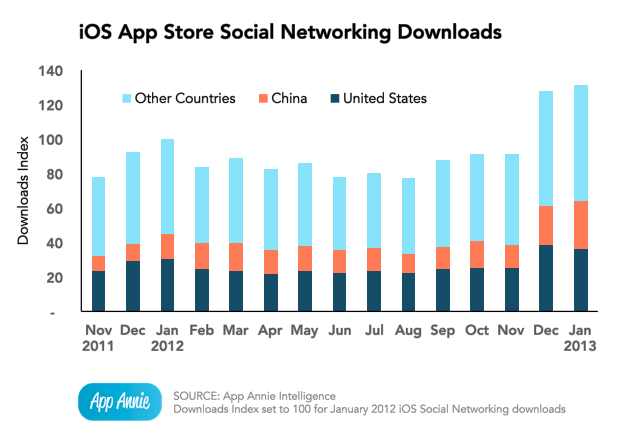 Facebook, Find My Friends, Twitter and Skype were the top four most-downloaded apps, according to App Annie. At Google Play, which serves up apps for Android-based devices, Facebook, WhatApp,Skype, Instagram, Twitter, Line and Viper all made it into the top 10 apps.